If you’ve ever thought to your self “DACs are all good and that, but what I really want is one I can open up and take a soldering iron to”, the Henry Audio USB DAC 128 mkII could well be for you. If you haven’t, it probably isn’t. This is an open source device, you see, in that Henry Audio is quite happy for you to tinker with it, both in terms of software and circuits. It even provides the source code and schematics for encouragement. That’s not really the sort of thing we’re into, though, and we don’t believe a great number of our readers are, either, so we’re looking at the Henry more as a standard DAC - which is also very much encouraged by the team behind it. Unfortunately, taken as such there are some immediate disappointments. For a start, our sample is pretty wonky. The whole chassis is slightly twisted. It at first seemed unusual to us that the DAC arrived with just three rubber feet to stand on, but it seems to be on the milkmaid’s stool principle: if it had four there would always be one that wouldn’t touch the surface that the Henry was sitting on. It’s not exactly pretty or stylish either, but that seems far less of a problem than the general shonkiness in the way it’s been put together. In terms of features, things are kept extremely simple: there’s a miniUSB input and stereo analogue output and that’s your lot. So yes, this DAC is specifically designed to bridge the gap between your computer and stereo amplifier - it is possible to connect an iPhone or iPad to it, but that involves a series of adapters and cables that aren’t included. In fact, even the miniUSB cable you need to make the connection to your computer is something you’ll have to supply yourself. The DAC itself is an asynchronous design, which means it takes over the responsibility for timing from the noisier, less accurate clock in your computer. This can make a pretty massive difference to the sound quality, so pretty much every DAC worth its salt these days goes down the asynchronous route. So just how is the overall sound quality? For starters, it’s a significant improvemement over a simple 3.5mm-to-analogue cable from computer to amplifier. Compared to that you get a good deal more detail, punch and - yes - rhythmic accuracy. Unfortunately for Henry Audio, though, it’s not the only DAC that does the same sort of job for a similar amount of money: it may look markedly different, but the recently reviewed DragonFly Red (£169) costs just £20 more, and while it’s angled more towards use with headphones, there’s nothing preventing you from using it as a bridge between your computer and amp. It also sounds notably better than the Henry DAC when you do so. 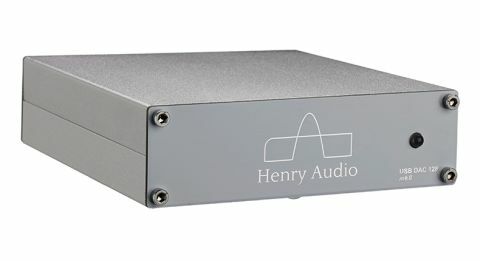 The problem is that while the Henry USB DAC 128 MkII improves on the performance you get from a single analogue connection, it doesn’t go quite far enough. Detail is good and there’s a decent amount of punch and good bass extension. It’s nicely balanced, too, with a satisfying weight at the bottom end that gives a good account of the chunky notes in Radiohead’s Burn the Witch. And yet there’s a nagging feeling that the Henry isn’t delivering on all of the drama and excitement of the track. This is partly down to dynamics - it conveys the big shifts pretty effectively, but lacks the more subtle, low-level changes that contain so much of the underlying texture and threat. It’s also a result of a lack of composure in timing that, while decent, allows the track to become more muddled than it should compared to the DragonFly, which orchestrates the carefully organised chaos a good deal more effectively. The Henry’s performance is quite front-and-centre, too, and while that level of projection is initially engaging, you soon begin to notice and regret the lack of space in the soundstage. All of this, in the end, means that while the Henry is undeniably a fine upgrade over the standard audio section of most computers, it’s not as much of an upgrade as the Audioquest DragonFly Red which, thanks to awesome portability and a built-in headphone amp, is far more flexible to boot. If you’re a hi-fi tinkerer, by all means add a star, but most hi-fi listeners would be better off spending their money elsewhere.